Mavis L. Wanczyk (right) with state treasurer Deborah Goldberg. 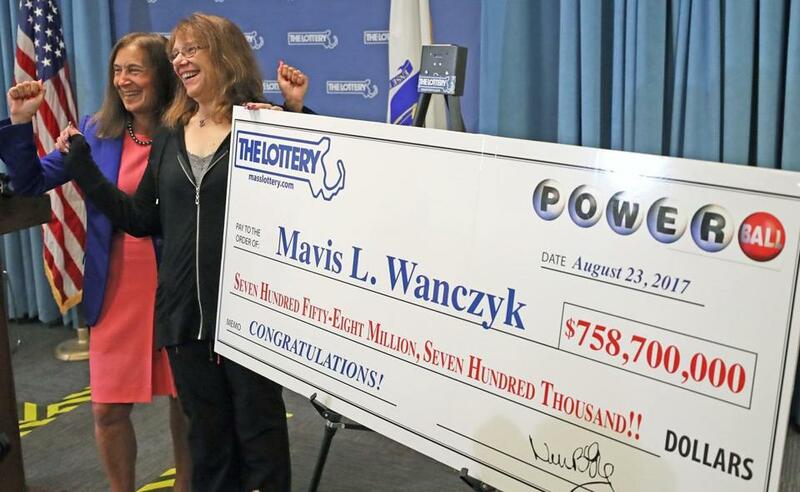 Wanczyk was the luckiest lottery customer of the fiscal year — a $758 million winner. The Massachusetts treasurer announced Wednesday that the state’s lottery earned $997 million in the 2018 fiscal year, money that will go to boost the budgets of Massachusetts cities and towns. It was the second-highest profit total in the lottery’s 47-year history. The record was set in fiscal 2017 when the lottery raised about $1 billion for cities and towns. Revenue for fiscal 2018, which ended June 30, was $5.3 billion, Treasurer Deborah Goldberg said in a statement. This year marked the fourth consecutive year that the lottery’s revenues went over the $5 billion mark, the statement said. The lottery set another record this year, when it paid out $3.9 billion in prizes, according to the statement. This amount can fluctuate from year to year depending on when players cash in their prizes. “With record or near-record figures across the board, Lottery players, our retail agents, and the 351 cities and towns in the Commonwealth all benefited from the Lottery’s fiscal 2018 success,” said Michael Sweeney, executive director of the Massachusetts State Lottery. ■ The lottery’s network of retailers earned a record $303 million in commissions and bonuses in fiscal 2018, surpassing the $300 million mark for the first time ever. ■ The lottery’s approximately 7,500 retail partners made an average of $40,000 in income. ■ The lottery’s administrative costs remained approximately at 1.9 percent of revenue, the lowest level of any US lottery. The lottery had announced in July an estimated net profit figure of more than $986 million, but a combination of factors, including interest earnings and other revenues, including season ticket subscriptions and lottery license renewals, accounted for the increase to $997 million, the statement said.